Enjoy a relaxed cycle tour along the Thames to beautiful Hampton Court with this 3 hour guided London cycle tour. This gentle cycle tour for two will take you to see some of London's loveliest landmarks and historic sights - cycling along the Thames to the fabulous Hampton Court Palace. With a knowledgeable and friendly guide to take you to these famous and historic London landmarks, you will get a real insight to some of the area's fascinating history. 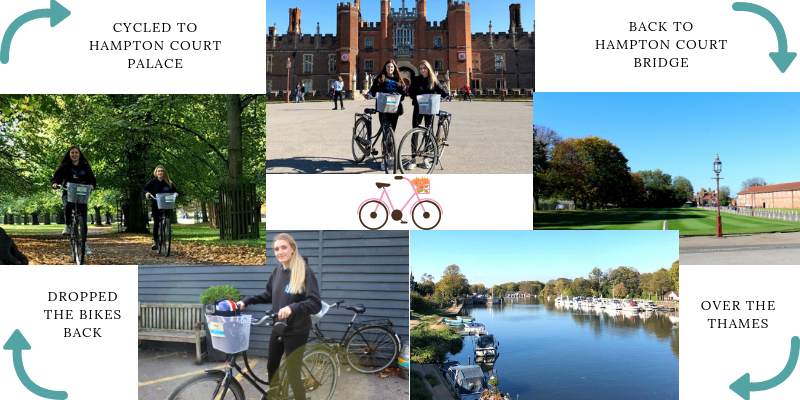 Your unforgettable Hampton Court Palace bike ride will involve exploring the grounds of the palace on a vintage-style bike. It's a fantastically interesting place and will keep you enthralled for hours as you enjoy the rich and often scandalous histories of the Palace's former residents. Conveniently starting and finishing at Hampton Court Train Station, you can easily get the train back to London whenever you are ready. Your guide during this 3 hour London cycle tour is funny and very knowledgeable, so you can expect a lot of laughs as well as plenty of useful (and some useless) facts and information! You will also stop off at a local, historic pub where you may wish to purchase some refreshments and snacks. A leisurely and gentle cycle tour, this experience is a really fantastic way to see some wonderful historical sights in a totally new and different way! A fantastic gift for those planing to visit London, but also for London natives who might like to see their city in a new light! The Hampton Court Palace bicycle tour is available on Wednesdays, Fridays and Sundays between March - October. Tours depart at 10:30 and 14:30. Please book in advance, to avoid disappointment. You must be at least 5 foot and able to ride a bike to participate in the Hampton Court tour bike ride. You don't need to be a serious cyclist or particularly fit to enjoy this experience; the cycle is a leisurely one! 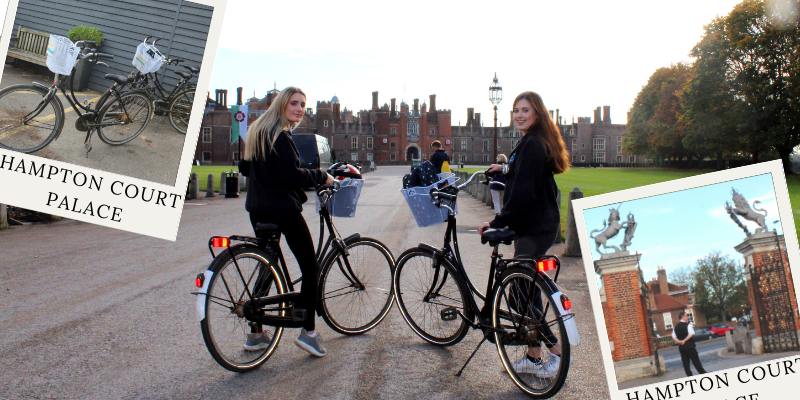 *Please note: The Hampton Court Bike Tour is a ride-only experience and does not include entry to the Palace itself. The Hampton Court cycling tour is a 3 hour experience that will cover approximately 8 miles. Start times are either 10:30 or 14:30. Participants: The Hampton Court Bike Tour for Two is for 2 participants. The Hampton Court cycle tour is not suitable for spectators. You should wear comfy, casual clothing that is appropriate for the weather on the day of your bike ride. Layers are a good idea. You will be riding vintage-style bikes, and will be provided with a helmet, on the day. The tour may be affected by very bad weather. If this is the case on the day of your booked Hampton Court tour bike ride, you will be contacted by your guide and will be able to reschedule for an alternative date. My wife and I couldn't wait to take part in this Hampton Court Bike Tour! Being huge Henry VIII fans we were excited to see where he spent the majority of his monarchy. The park is gorgeous and the wild deer wandering really does add to the whole experience. Halfway through our bike tour we were able to grab a quick drink the pub before heading off again. The tour guide was extremely knowledgeable and obviously very passionate about Hampton Court - it was great to see! I had always wanted to go to Hampton Court and what better way then cycling through the autumnal leaves whilst a tour guide tells you all the facts you wish to know. Trisha was an excellent tour guide and knew everything about Bushy Park and the Palace. She also had a great eye for deer spotting, even though this wasn't hard with their being hundreds of deer and stags in the park. This was a lovely day out and a great way to exercise. We carried on cycling through Bushy Park, and were constantly taken aback by the autumnal beauty of our surroundings. Some of the oak trees were 500 years old, and their colourful leaves meant we were able to take some amazing photographs. It wasn’t long before we saw a herd of deer grazing in the sun, a male stag prancing around them to get their attention. None of the females showed any interest - has no one told these stags that arrogance is never attractive to a lady? Tricia had a lot of background knowledge on the history of the park, and I found it particularly interesting when she spoke of Bushy Park being the US air base Camp, Griffiss, during World War II. We saw many plaques on the ground marking blocks of buildings in Camp Griffiss - 16 in total. As well as the many historical facts, we also learnt of the celebrities that live in the area! This tour really is interesting for everyone. Tricia then showed us to The White Hart Hotel, where you can help yourself to water, and have the opportunity to buy food if you wish. 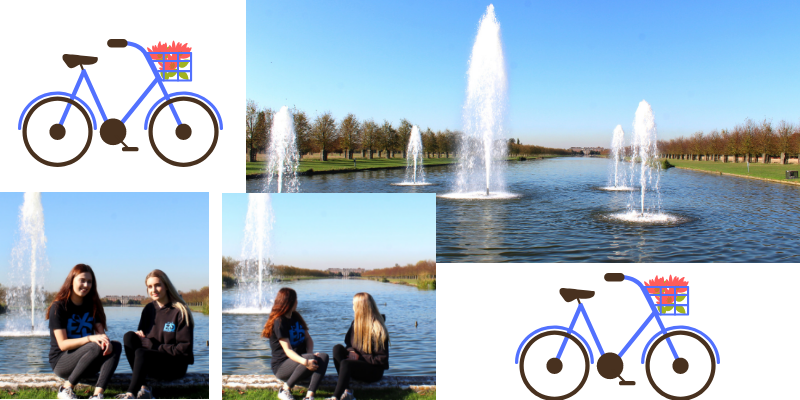 After this, we continued to cycle through Hampton Court Park towards The Long Water that leads up to The Great Fountain Garden. The fountain display was amazing, and the view of the Palace was so picturesque. We couldn’t help but take a picture of ourselves sat on the river’s edge before continuing our cycle along the River Thames. We stopped outside the Golden Gates of Hampton Court Palace, where Tricia passionately told the story of Henry VIII’s six wives, and how Catherine Howard was kept prisoner in Hampton Court before her execution. Apparently, the ghost of Catherine is said still be haunting the palace today! We carried on cycling to the main entrance of the palace, and Tricia continued to amaze us with her knowledge! We walked our bikes back over the bridge, through the lively village, and back to the courtyard. After hearing some insightful lunch recommendations, we thanked Tricia and went on our way! 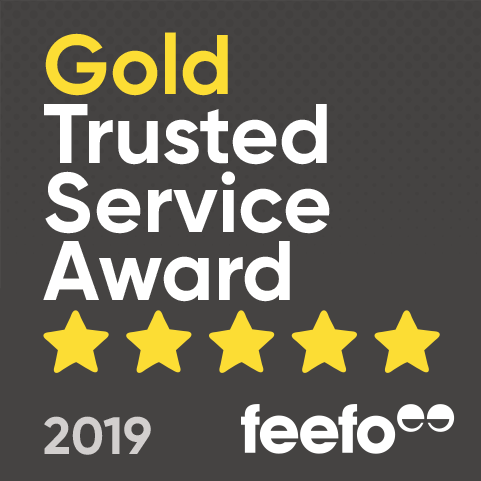 Being so close to Hampton Court station with frequent buses out of the area, this location is easy to get to and from – not that we wanted to leave! I can’t thank Tricia and Coddiwomple Tours enough for a fantastic experience! 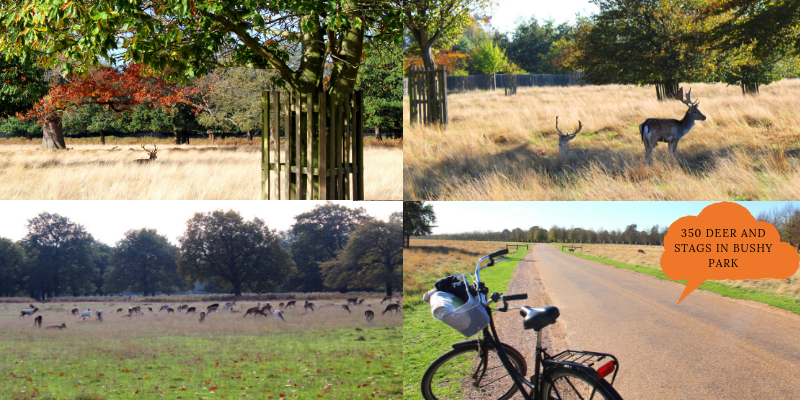 Combining cycling, learning, and admiring the beautiful animals of Bushy Park created an unforgettable tour, which I will be recommending!